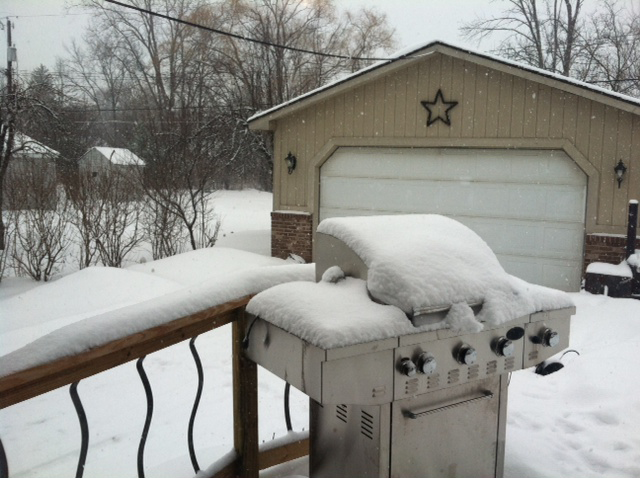 day thirty two – more snow. What else? Last night we were told to expect another 4 to 6 inches of snow this weekend. Oh boy. We’re really enthused. Can you tell. I did my grocery shopping last night to make sure the house was well stocked with plenty of food and beverages, so that if we didn’t have to go out, we didn’t have to go out. The snowfall began about 9 am this morning, and it has been falling pretty steadily since. We have over three inches already. The winter storm advisory is in effect until midnight tonight. We’re also expected to receive more snow later in the week. I believe many of us have already thrown in the towel with this winter. Worst part is that winter is only 1/3 over. It isn’t even 1/2 over. We still have February and March. Earlier in the week I decided I was going to try to sew a dog vest for Phoebe. Yes, I figured it can’t be too hard – It doesn’t have to much curves. 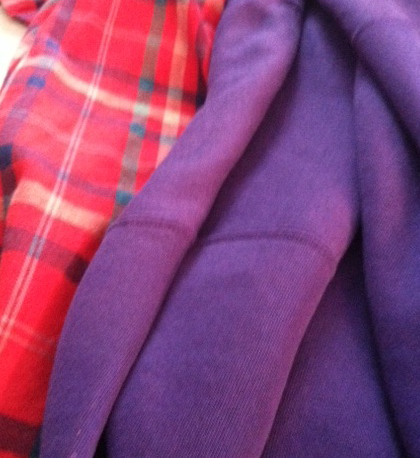 I was going to use flannel and sweatshirts – “upcycle” by going to the Salvation Army. 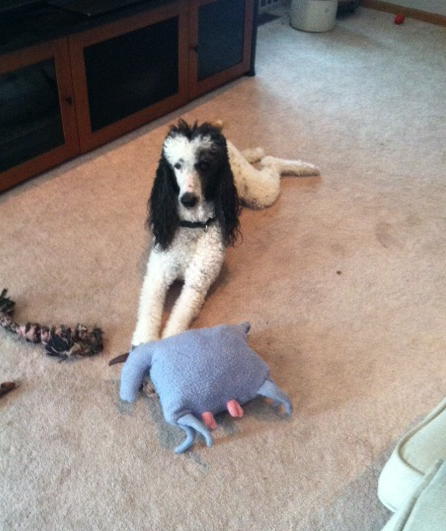 I found a couple of colors that I liked, that I thought would look good on my diva, Standard Poodle, Phoebe. The sweatshirt would be the “underside” and the flannel would be on the top. I plan on using velcro to be able to fasten the vest onto her. Here’s the photo of my diva: Yes, she is a diva, and she knows it. Today, this morning, while I am waiting for the bread to rise for the stuffed hamburger cabbage rolls I am making, I made a pattern for the dog vest out of paper bags. I “attempted’ to get measurements from Phoebe. Attempted is the right word since I could not get her to sit or stand still long enough for me. I can’t stay angry at her, she is so funny, really. But anyways, I have a pattern and I think it will work and fit her. Since we’re snowed in for the weekend, it will be a good project to do. As for the Superbowl this Sunday evening, I think I am going to root for the Seahawks. My car is at Sound Advantage getting a remote starter and stereo installed (actually its being swapped from my old Audi into my Buick Century.). We plan on donating the Audi to Mother Waddles. Sometime this weekend, it’s homework time. (CCS and Grant writing class). It’s only 12:55 pm right now. The day is still young. How about you? Carpe Diem. day thirty three – the groundhog did not see his shadow.